L L os Angeles is huge. MASSIVE. Even the neighborhoods have neighborhoods.There is so much happening at once that you could be overwhelmed into just staying in your comfort zone. 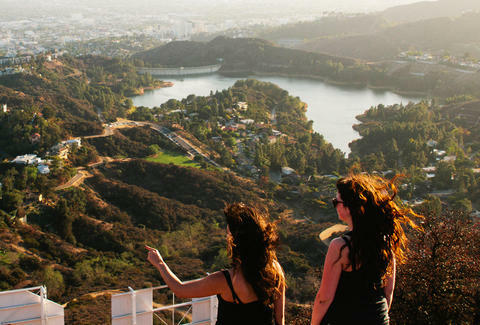 But we just made navigating LA’s crazy social map considerably easier, with mini neighborhood itineraries for what to do, and where to go -- wherever, and whenever. It’s time to branch out. Drive, bike, boat, or walk up to this 24 hour section of Killer Shrimp, located right on the water in the Marina. Load up with a giant breakfast burrito on the patio while you check out the salty dogs working on their boats. Head over to Marina Paddle, where lessons are available for first-time paddle board renters -- though it actually is easier than it looks. And/or cruise around the Marina and get right up in the faces of seals and things. Direct your rubbery legs toward The Warehouse at the south end of the Marina. It’s kind of a Disney-looking take on a sea shack, on stilts over a koi pond. Get a table outside, order your reward, and pat yourself on the back. Turn off Los Feliz Boulevard onto Fern Dell Drive, past the Bear statue. The hike starts across from the Trails Cafe, and will lead you to the James Dean statue and a great view of the Hollywood sign. Breathe it all in, Griswold style, before you head back down. Roll down to Sunset Boulevard and take a load off at Millie's Cafe, and get the Crab Benedict. Trust us. That and a stiff cup of joe will do you right for the rest of the day. After you stuff yourself at Millie's, you'll probably be feeling lazy at this point. Head on over to Skylight Books, so grab a bench under the skylights, and sit down to check out the latest bestseller or arty magazine (LOTS of magazines here) -- or slyly check out the hot hipster doing the same thing. A perfect spot to "Meet cute". (Oh, and you can drop the trivia that Arrested Development/Transparent's Jeffrey Tambor is a part-owner!). Now that's a solid morning in East LA. Even California natives feel like tourists at the Santa Monica Pier, but you can still front like a local. There's not a lot more SoCal than digging into a snack from Hot Dog On A Stick (located at the base of the beginning of the Pier on Ocean Front Walk), or hit up The Albright, which has the best fish and chips, no contest. Then, saunter over to the nearby open air chess tables and get schooled by an old time regular. Check out the Santa Monica Pier Aquarium, a hands-on learning facility where you can touch a spiky sea urchin or get squirted by a swell shark from their open tanks. Heal The Bay volunteers will answer your questions, so you'll leave armed with some good aqua trivia. The Lobster on Ocean Avenue has THE premiere view of Santa Monica Bay, made even better with a drink like the Thai 1 On (Ketel One, muddled basil and jalapeño, ginger beer). You might just find yourself lingering until the best view of the sunset too... or at least the flashy Ferris wheel. The Paley Center For Media is the museum for people who’d… rather watch TV than hang around museums. Check out massive collections of just about every show, ever, as well as special exhibits like the U.S. Olympic Archive -- in time to hype yourself up for this Summer's Rio games. Stop by the Sprinkles ATM -- the world’s first 24/7 fresh cupcake and cookie dispenser. Make your choice, swipe your card, and walk away with a little box of happy. On this pier, even tourists feel like natives. Much less gimmicky than its pier relative down south, here is what California really feels like. Get a delicious fresh, organic, local lunch at Malibu Farm on the end of the pier, like the zucchini crust pizza -- um, yum -- and a smoothie to wash it down. Now you're ready for anything. This is Gidget and Moondoggy turf. Surfrider Beach is historic. So, when in Malibu, consider surfing compulsory. Malibu Surf Shack will set you up with everything you need to hang ten -- from boards and wetsuits to lessons and wax. You can almost hear the Beach Boys in the wind. Surfing is tiring. Good thing there are lounge beds on the patio over the crashing surf up the PCH at Moonshadows. Get there at this off time to claim a bed, sprawl out and chill with clam chowder and a margarita on the rocks. Grab a bench outside this spot on Windward Avenue in the shadow of the famous Venice sign. Say hi to Nicely -- a multiple time National Champion Barista -- and get THE perfect latte. Made with Four Barrel Coffee. World-famous Venice Boardwalk has quite possibly the world's best people watching in one stretch. That would almost be enough, but you can't be down there and not stop in at the Venice Beach Freak Show. For a mere $5, you can step inside the old-timey emporium of oddities and see everything from owner Todd Ray's five-legged dog to a bearded lady and Larry the Wolf Boy. High Rooftop Lounge at the Hotel Erwin has exactly no competition for a scenic drink in Venice. Take in views from the ocean to the snow-topped mountains in the east as you sip on one of their killer cocktails, like the Drunken Swede -- Fireball, spiced cider, orange peel, star anise -- Skål! This recently revamped alley is all dark and cool, with black-lit lanes and a full bar. A friendly staff keeps the place rocking with a loud soundtrack and movies play on the wall as you bowl. Sensory overload, in a good way. Get some better than average bowling alley food, but not too much, 'cause you're going to Louie's later. 7pm: Emerge from the neon cave and walk over to the other end of the spectrum at Time Warp Records. This full service, serious musical instrument shop is also one of the best places to see live shows from local and touring musicians who really mean business, right there in the store aisles. A recent show featured Bob Forrest (Thelonious Monster) and actual decent comedians on the same bill. Awesome. A huge hive was discovered during construction of this bistro, and it now resides on the roof and provides honey for the kitchen and bar. Try the Bee Sting (Apple jack brandy, honey, ginger beer, lemon) with some Togarashi bacon fries. The One Up is both a "gastrolounge" and old-school arcade. Goat cheese tater tots and Cap'n Crunch-covered chicken wings, while playing vertical Donkey Kong? Don’t mind if we do. "Without ice cream, there would be darkness and chaos." So reads the sign at Local Ice, a classic "yet curious" ice cream parlor. Get Salty Sam's Caramel, and there will be lightness and order. Owner Dave Gibbs pulls from his personal wine collection, and the rare vintage chalkboard always features something interesting. Want to try a 1961 Burgundy? They got you. A1932 Burgundy? Be right up. Even if your taste runs more to Trader Joe's, you'll emerge a little more wine savvy; these guys know their stuff, and are happy to educate. This Scandinavian/Turkish (!) hybrid serves up everything from herring to hummus, and you can wash it down with authentic akvavit. The Cinema Bar has been an LA institution for 65 years. It's a dive bar, a real honky tonk, and the music is usually in the vein of players playing for other players. The bartenders are tough, and the music is reliably great. The Old Man Bar (real name) in the back of this Southern charmer of a restaurant is where it's at. The look is decidedly as the name suggests, with taxidermied animals, antlers, dark wood, and a fireplace. But the drinks are as new and fresh as a kid with a fake i.d. Sip on an "In Fashion" (country ham bourbon, pecan bitters, demerara sugar) and listen to some vinyl. Or your imaginary one, as you puff on a fine Cuban while playing a game of chess or checking out some art. So very classy. This historic, multi-level extravaganza demands that you and your friends coordinate really well, or endure much “I’m here! Where are you?”-style back-and-forth. Visit The Monarch (a Deco looking soda fountain), The Brookdale (elegantly appointed with live music), The Gothic Bar (a… Gothic-style bar), Pacific Seas (think Tiki), and the cafeteria itself, with its good food and forest theme. A whiskey bar for serious whiskey drinkers, they even have a Whiskey Society, for patrons who really mean business. It has a hunting lodge (a really nice one) vibe. If Japanese whiskey is your thing, check out the Jackalope Bar in the back -- an 18-seat Japanese whiskey bar with over 120 varieties of the devil water. Kampai!